Pika (Ochotona princeps) are a type of lagomorph that like to live in rock piles in the mountains. They are very vocal, making a high pitch squeek as an alarm call. Apparently they also sing during breeding season and the fall. 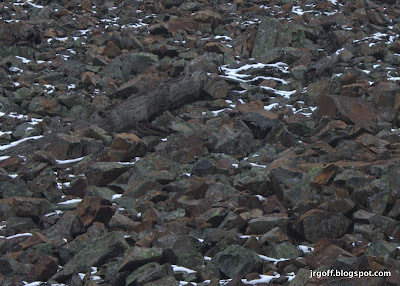 It is possible (just barely) to see a pika in the blog-sized version of this picture. I recommend clicking on the image to enlarge it for a more reasonable challenge though. I think the uncropped version might make a fun jigsaw puzzle. 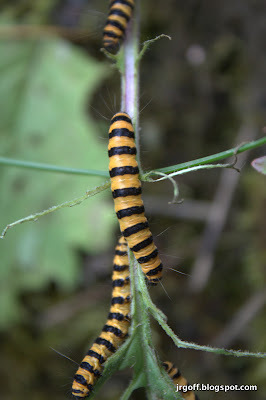 A few weeks ago I was out scouting locations for a tracking class and I noticed these caterpillars. They really seemed to like this plant, as every plant like this I noticed in that area was demolished and had up to a couple of dozen of these caterpillars on each plant. Unfortunately the remnants of the plants were not familiar enough that I could figure out what kind of plant it was. I tried to identify the caterpillar on cool identification site, but though it returned a result (Utetheisa bella) the pictures of that species look enough different from mine that I suspect they are not the same critter. Last weekend I went out into the Pasayten to place a couple of wildlife cameras for Conservation Northwest's camera project. 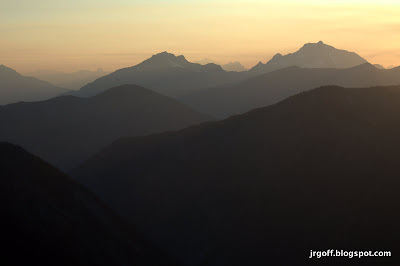 The land up there is spectacular (the above picture is a view towards North Cascades National Park from Slate peak). Lots of rugged peaks, wildflowers and wildlife. Though it was hazy all weekend, we got a pretty good view of the night sky. The moon was nearly full and once it set the stars really popped out. During the night I heard coyotes across the valley and a couple of owls (great horned, I think) calling. I woke in the morning to the sound of deer pronking by. A group of 9 of them were eating and playing lower down the meadow from where I slept. In many places along the hill sides there were rodent holes of various sizes. Considering the number of holes, I was surprised that we only saw the occasional chipmunk, a pika and two ground squirrels.